Uglyworld #821 - Armin Van Babo (277-365), originally uploaded by www.bazpics.com. 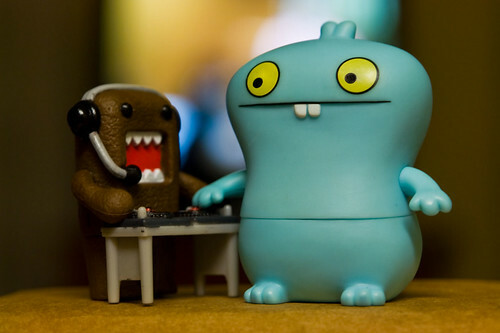 Babo was busy this evening taking some DJ'ing lessons from cousin Domo who brought his mixing decks along with him when he came to visit. Babo is already referring to himself as "Armin Van Babo", after his favourite DJ, Armin Van Buuren who's A State Of Trance radio show he listens to every week on Digitally Imported Radio. "I will asks Armin if I can plays at one of his future shows, I is sure he will says yes! ", he told Domo as his lesson for this evening was coming to an end. Domo reckons Babo has as good a chance as any, as his skill level is improving rapidly.